Whatever your reason for not wanting to leave your furry friend behind when you go on vacation, it is now more possible and acceptable to take your pet with you on the road than it was just a few years ago. Vet care for cats and dogs should be provided before any big trip, whether you take them with you or keep them at a local boarding facility. New Bedford pet owners should take care to provide every option for safety and security while on vacation to ensure that everyone has a good time and arrives home in good shape. Veterinary care in Massachusetts can provide you with pre-trip check-ups, vaccinations, and boosters, including heartworm treatment for dogs or flea and tick prevention. 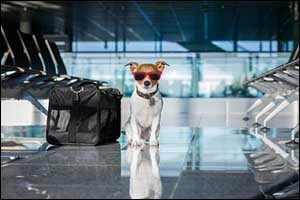 While there are more opportunities available to pet owners who want to bring their pets with them on vacation, not every destination is ideal for dogs and cats. Some countries may have restrictions and put a quarantine “hold” on pets, separating them from their owners during the first part of the stay. Unless you will be there for a few weeks or more, it is probably better to keep your pets at home and board them with a trusted service. If you aren’t sure or have any questions about safety issues in a certain part of the country or anywhere around the globe, you can always ask your veterinarian when you come in for a check-up to get vet care for cats and dogs. For example, heartworm treatment for dogs is essential in areas where there is a higher risk of exposure to mosquitoes and related illnesses, such as the southeastern states. Some parts of the country will also have other considerations, such as exposure to fleas and ticks or other pests that can carry or spread disease. New Bedford pet owners can receive veterinary care in Massachusetts in advance of a trip, getting vaccinations and other preventive treatments to help keep their pets and family members safe while on vacation. Talk with your vet about the locations that you plan to visit and make sure to ask for advice on keeping your pet safe in different weather conditions, altitudes, and regions. Pet care at the lake is much different than pet care in the woods, mountains, desert, or near the ocean. Make sure to plan ahead as much as possible. In addition to visiting with your veterinarian before your trip, make sure to do some research in advance. If you are staying at hotels, campgrounds, or resorts, check to see what the rules and restrictions are about pets. There are certain places that won’t allow pets, while there are some surprising locations that make special accommodations for your four-legged friends. More hotel and motel chains are now allowing pets with a special deposit. Motel 6 and La Quinta Inns have a nationwide policy to accept pets, and many locations have special “dog walking areas” right on the property. Still, it pays to call ahead and find out what is available before you hit the road. No matter where you are going or what you plan on doing with your four-legged friend in tow, make sure to receive vet care for cats and dogs before you go on vacation. New Bedford pet owners can receive veterinary care in Massachusetts at Anchor Animal Hospital. Located in Dartmouth, we can provide a broad range of services including flea and tick prevention, vaccinations, annual check-ups, prescriptions for anxiety and other issues, and even heartworm treatment for dogs. Give us a call at 508-996-3731 to schedule an appointment or to learn more about the veterinary services we provide.